My husband, Clinton, and I aren't the kind of parents who send our kid to a sitter for every occasion. Granted, there are some times when either my parents or his parents will watch him for a few hours, but even after 16 months, I've never spent the night away from Lucas. I've become somewhat of an expert at traveling with a kid (out of choice, not necessity). Lucas goes to all of our Robotics Team's meetings, competitions, and has even traveled by bus to the World Championship in St. Louis... twice. We've figured out that if we got a sitter for each of our meetings and events, we'd never see Lucas. Our schedule is very demanding, often meeting six or seven days a week for a combined total of more than 40 hours. I've found a way to streamline the amount of "stuff" we take when traveling, (this time out of necessity, not choice! When you drive a 2-door Mustang, you don't have many other alternatives), and came across many ways to make traveling easier on both myself and my husband. 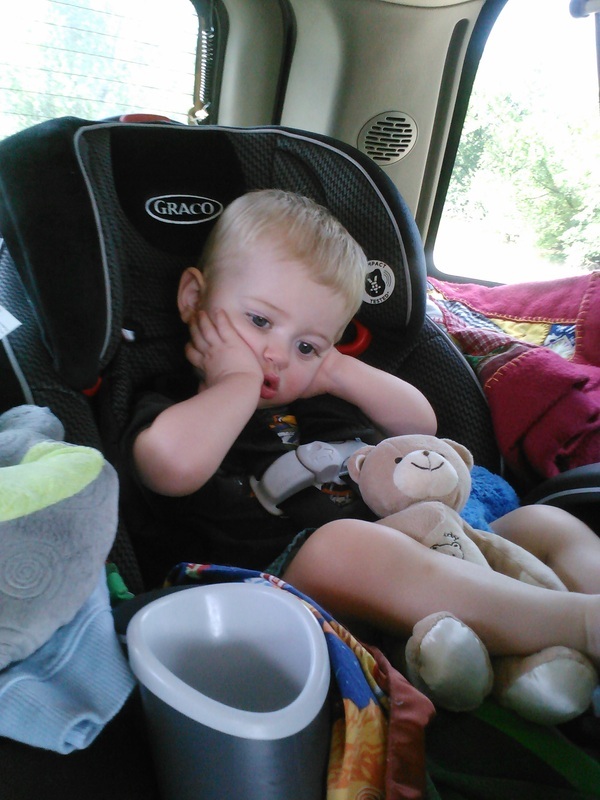 Taking a Toddler on trips is considerably more difficult than toting a baby. Losing the convenience of the infant car seat has had a significant impact on the efficiency in which we travel, but since there's no way to change that, we've made alterations to our methods. Here are some things that I have found to make my life loads easier, and recommend to you. We've done our research, and all of these items have high safety ratings, and have been use-tested (by us and our busy schedule) for durability and ease of operation. I'm sure that this goes without saying, but kids need something to do when they travel. I'm not a huge fan of the all-too-popular in-vehicle DVD Players (though admittedly, our Yukon has one, and I have used it), and I much prefer to entertain Lucas the "old-fashioned way" while we're traveling.